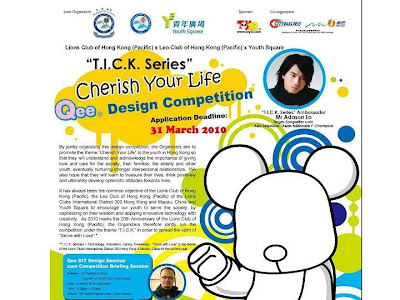 By jointly organizing this design competition, Lions Club of Hong Kong (Pacific), the Leo Club of Hong Kong (Pacific......) of the Lions Clubs International District 303 Hong Kong and Macau, China and Youth Square aim to promote the theme “Cherish Your Life” to the youth in Hong Kong so that they will understand and acknowledge the importance of giving love and care for the society, their families, the elderly and other youth, eventually nurturing stronger interpersonal relationships. We also hope that they will learn to treasure their lives, think positively and ultimately develop optimistic attitudes towards lives. Contestants’ Eligibility: Contestants shall be Hong Kong residents below the age of 25 (as at the application deadline). All the above awardees shall receive a Qee doll, a limited edition bus model and a trophy. All the Qee Bears produced at the “Qee Bear Mass Creation Day” shall be exhibited at Youth Square from 9 May onwards.